Douro wines are beginning to establish themselves as Iberia’s best. This is a controversial statement: let’s face it, Portuguese wines still play second fiddle to those of Spain. The Spanish regions of Rioja, Ribero del Duero and Priorat all boast icon wines that sell for enormous sums. Am I therefore mad to suggest that the Douro has more potential than all these three classic regions, and that it is beginning to realize it? You might think so, but let me put my case. Look at the terroirs of the Douro. Fantastic schistous soils, with any variety of slopes, altitudes, aspects and orientations possible because of the Douro river and its snaking tributaries, with towering banks on either side, flattening out somewhat towards the Spanish border. Then look at the grape varieties. Spain has Tempranillo, Garnacha and Carignena in its premium regions, with bit part roles for the likes of Graciano and Cabernet Sauvignon. The Douro has Touriga Nacional, Tinta Roriz (Tempranillo), Touriga Franca, Sousão, Tinta Cão, Tinta Barocca, Tinta Amarela and many others. But then consider the scale: the Douro is huge. Amazing untapped potential, compounded by the fact that currently a lot of the good grapes go into Port. As the table wine revolution here gathers steam, the quality of the new wines emerging is fantastic. So we come to tonight’s wine. 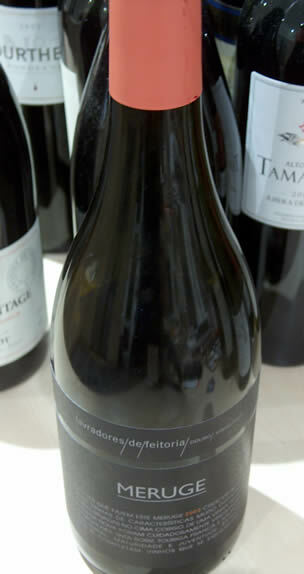 Meruge 2003 from Lavradores de Feitoria. This producer is an association of 15 quintas, and this is one of their top wines. The shape of the bottle—Burgundy—gives something away. This is a wine that’s made in a more Burgundian style, meaning that the emphasis is on elegance rather than structure. As you might expect, Dirk Niepoort is behind this wine. It’s quite dark coloured. Deep red/purple/black in colour. The nose is very inviting. It’s ripe, deep and smooth, showing a subtly chocolatey edge to the red berry fruit. There’s some freshness and spiciness, too. The overall impression is one of elegance coupled with concentration. The palate is smooth and elegant with a good concentration of sweet red fruits. There’s a lovely structure here: some spicy tannin, a hint of greenness under the sweet fruit, and good acid. The overall impression is one of a serious, classy, complete wine. It’s certainly not Burgundy—the fruit is too ripe for this—but there’s a delicious elegance here that is more Burgundy than it is Bordeaux. There’s a suggestion of modern-ness, with the slightly roasted, chocolatey notes hiding beneath the ripe fruit, but it’s not a distraction from the main theme of the wine. Besides, in a young wine like this where the stems have been included (half the wine was made with stems), it’s easy to confuse the stem imprint with oakiness. Overall, I think this is an interesting, complex, elegant wine that may well develop very positively over the next few years. It’s serious, to the point that even on this early showing I’d score it at 93/100, and a fantastic ambassador for the new fine wines of the Douro, particularly because with its somewhat Burgundian profile it offers a glimpse of another side of what the Douro is capable of. The label design is fantastic. I have no idea what this wine would retail for in the UK, but my suspicion is that it would be around £20. Raymond Reynolds represent the Feitoria wines in the UK. Drinking window? It’s lovely now, but best in 5–15 years time, I guess.